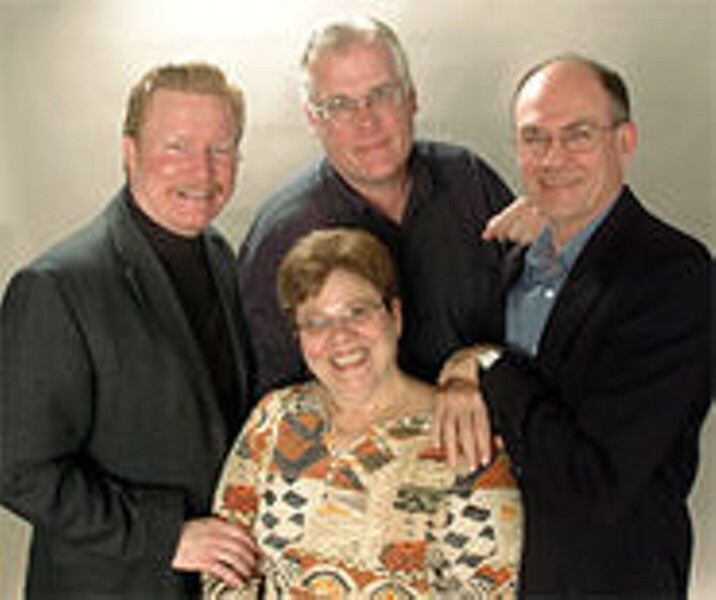 On with the shows: Steve Isom (left), Doug Finlayson (center), Rob Townsend (right) and Kathleen Sitzer (seated). Nominees for the second annual Kevin Kline Awards will be announced at 11 a.m. on January 19, 2007, on KWMU (90.7 FM)'s Cityscape. The awards ceremony is scheduled for March 26, 2007, at the Roberts Orpheum Theater. For information, consult www.kevinklineawa rds.org. Exactly one year ago this week, as the 2005 theater season was winding down and judging was wrapping up on the first crop of Kevin Kline Awards contenders, we brought together four participants to discuss this new catalyst upon the local theater scene. Now that the Professional Theatre Awards Council, which administers the awards, is nearing the end of "the terrible twos," and with the 2006 nominations again just a few weeks away from being announced, it seemed prudent to reunite those same four - Kathleen Sitzer, artistic director of New Jewish Theatre, judges Doug Finlayson (associate professor of theater at Webster University) and Rob Townsend (producing director of the Shakespeare Festival of St. Louis), and PTAC executive director Steve Isom  for a reappraisal of the process. Dennis Brown: Last year you were all clear about the fact that the Kline Awards were designed to promote the theater community rather than individual competition. Can you point to any tangible evidence that this has happened? Kathleen Sitzer: Yes. This year more theaters are eligible to be judged, so theaters apparently found the process to be something they wanted to aspire to. I think the bar has been raised. I think there's been some wonderful theater in this town. The competition is very stiff this year. Doug Finlayson: I agree. Going from theater to theater I felt a sense that people want to be part of this. I don't know that a sense of competition is necessarily a negative. Competition is not necessarily at odds with the idea that we're building a community. I don't think people build their sets thinking, "I'm going to beat the Rep this year," but the very presence of the awards raises the bar internally, based on your own desire to go further artistically. Sitzer: I'm glad you brought that up, Doug. We talked last year that it's not about the competition, but competition is an important aspect of this program. The competition is what's causing everyone to strive to be more professional. That's not necessarily a bad thing. Steve Isom: I think theaters have seen that  even though it wasn't our intent  it has a tangible effect on a company if they win some awards. Look at the Orange Girls. After they won three Kevins, COCA called them and said, "We want you to be our resident company." As for growth, the PTAC has gone from 23 companies last year to 32 this year. And the number of shows we've judged has increased from 79 last year to 95 this year. Rob Townsend: I think those numbers speak volumes. Last March, the end result after the awards ceremony was perfect, because the awards did recognize both small theaters and large theaters. That said so much to the community at large, because everybody now knows that recognition isn't going exclusively to the big guys. Kathleen, when we spoke last year I sensed that you had a reservation as to whether or not the judging could favor a smaller theater. Then New Jewish was nominated for five awards and won one. Did that validate the legitimacy of the process for you? Sitzer: I think so. The system seems to be working. The small theaters are still struggling with the technical awards. That's an issue, but it's part of the growing pains of figuring all this out. I think the judging process is very even. At the same time, in terms of opportunities, a theater like New Jewish, that staged three productions this year, is never going to be on an even keel with the Rep, which did 15 productions. Finlayson: I still think that in the judges' minds, money does not equal quality. This year, scenically, I was noticing some of the smaller companies doing more. Rob, as a judge did you feel like a winner? At the ceremony did you see shows that you had voted for go on to be recognized from the stage? Townsend: Yes, I did. Bear in mind that I was one out of 36 judges, and I judged 12 out of 79 productions. But I also saw a lot of other plays on my own, and it was nice to see the ones I wished I could have voted for do well. I was tickled to death when Orange Girls was so wildly accepted. That was a treat. In that little space in that little theater, those women took off. It was superb. So to see merit rewarded at the awards ceremony validated the whole process. I think everyone's in agreement that the distribution of awards last March was ideal. Is there any concern about that anything less than ideal could be construed as a step backwards? Isom: I hope that by now people understand the process. It's quite possible that one of these years the awards will heavily favor the Rep, or whoever. But the process is equitable, so if it happens, it happens. And if it happens, it should happen. The judges are being fair, and they're not going to purposefully spread out the awards. They're going to choose what they think is best. Finlayson: When I lived in Chicago in the 1970s and '80s, people expected the Goodman to do well. It was the most heavily endowed theater. It had been there forever. But I remember the year a very small company called Famous Door took the top award for best play, and it reminded everybody that it didn't have to be the Goodman every year. We ultimately just see how it shakes out. Would you want it any other way? Townsend: I think there may be some further disappointment this year because there are more plays. The number of nominations has not increased, but productions have. Sitzer: Some of that disappointment might come from the fact that some of the newer companies have risen to the bar of eligibility in the PTAC, but they might not yet have risen to the bar production-wise. So you might have a lot of new entries in the field and yet still have many of the same people from last year being nominated. It's just possible that disappointment of that nature could lead to some attrition in the PTAC in the future. Isom: Here's a concrete example. Last year we couldn't fill the category of "New Play or Musical." We only had three nominees. This year in that same category a dozen shows will be competing to fill five slots. That might lead to disappointment, but how great for the community. Townsend: It's about the community. I've been a proponent of that from the beginning. That's why this is a good program. But if you think about me as a producer for a minute, the Shakespeare Festival only does one mainstage play, so now that one production stands against many more than it used to. That's life. What are you going to do? An increased number of productions is good for the audience, certainly, and it's good for the practitioners because there's more work. That's what we want: growth. Beyond the awards, what else has been accomplished this year? Isom: We're starting to do more advertising for the theater community as a whole. Our education program is underway; we're now offering free tickets to high school students. Our theater roundtables are part of our philosophy that getting everyone together will create things. We want to keep the dialogue open. We feel that we're in a partnership with the theaters and we want their input. Finlayson: In Chicago the theaters were very aware of each other's work. There was a connectivity that I think St. Louis is moving towards. I think that's the most important thing here. The awards and the celebration are the most visible part. But when I go into a theater lobby and see people reading the Kevin Kline poster, there's a heightened awareness that all these theaters are part of a community. And developing this increased sense of community is the main strength behind what's happening.